Turn back time... with nutriance! Nutriance helps you turn back time every single day! 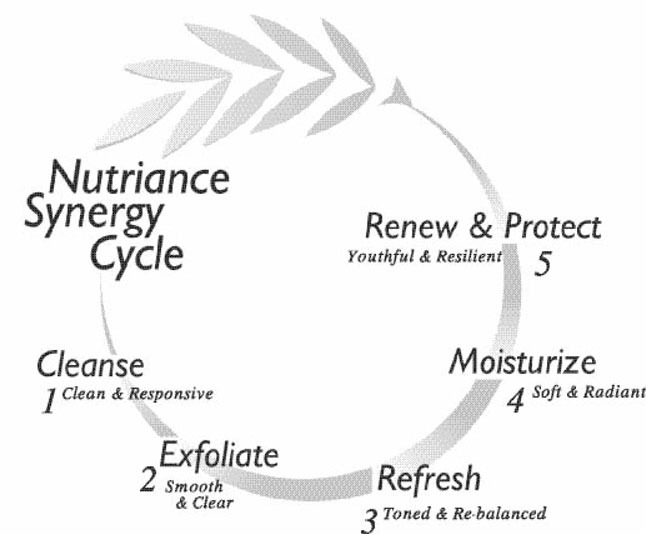 Intensive, time-defying factors, delivered through the exclusive Nutriance Synergy Cycle, can stop, prevent - and even reverse - the effects of time on your skin. Exclusive Swiss laboratories, guided by GNLD’s Scientific Advisory Board, combine selected botanicals, exclusive ACR technology and Green Tea, Echinacea and Vitamins A, C and E for antioxidant and immune-boosting power. Youth renewing. Nutriance reverses signs of aging by erasing fine lines and wrinkles, replenishing lost moisture and enhancing cellular renewal. Skin looks, acts and feels more youthful! Skin protecting. Nutriance delivers broad-spectrum UVA/UVB protection to shield skin from solar damage while delivering potent antioxidants, for vibrant, younger-looking skin! Age defying. Nutriance protects collagen and elastin structure to defend against “photo-aging,” and creates a youthful moisture-lipid balance. Defy aging with every use! Rediscover the resilient, glowing skin of your youth and keep it looking younger, longer, with Nutriance - your age-defying solution! Each product builds on the performance of the previous step, preparing skin for the next. With Nutriance, you’ll triumph over time and the aging effects of your environment. Find out just how youthful your skin can look, act and feel - with Nutriance.